Bert Trautmann's son sees worrying parallels between the racist abuse directed at today's footballers and the hatred encountered by his father, who used to "come off the pitch covered in phlegm" after being spat at by fans. The German goalkeeper experienced intense hatred and discrimination when he joined Manchester City in 1949. Trautmann was abused and spat at by his own fans as anti-German sentiment ran high in the aftermath of the Second World War. Prejudice is also a blight on the modern game, with a number of incidences of players being racially abused this season. A current City player, Raheem Sterling, was abused in a game at Chelsea in December and he was also on the field when England players were targeted in Montenegro a fortnight ago. England defender Danny Rose has since said he "can't wait to see the back of" the game, so frustrated is he with the situation. "It must be difficult for players today not to react to this type of intimidation from fans," Mark Trautmann, 58, told Press Association Sport. "It must be hard to learn to do that, not react. It's a shame it's there. "My dad, no doubt, would have had something to say about it. He was quite upset about the modern game and the way racism and hatred could be directed towards players, especially throughout Europe. He did think it was a bad thing for the sport. "I think he must have had a lot of control not to react. He would have been booed at, sworn at, spat at. My auntie said he used to come off the pitch covered in phlegm that people had spat on him from behind the goal." Trautmann came to England as a prisoner of war and settled in the north west after his release. City sparked public outrage when they signed him after watching him impress for amateur side St Helens Town. His talent and determination eventually won people over and he went on to make 545 appearances for the club. He earned a place in folklore when he played on after breaking his neck in the 1956 FA Cup final. His life story is the subject of a powerful new film 'The Keeper', starring David Kross, which was released last week. The picture deals in depth not only with the footballing story and the acceptance issues Trautmann faced, but also his family life and personal tragedy. "It tells the story really well," said Mark Trautmann. "It's not just about my dad and that he broke his neck in the FA Cup final and was an ex-prisoner of war. "There is dramatic licence in there, which you can expect in a film such as this, but there are certainly different facets to the film, so many different points you can take out - his courageousness, facing animosity and hatred going out onto the football pitch, the way he overcame the loss of a child and also his past life during the war was there to haunt him as well. "There are a lot of different avenues." Trautmann, who died in 2013 at the age of 89, never lost his affection for Manchester, its people or the club after he retired. He remains a revered figure at the Etihad Stadium, where there is a statue of him at the main reception. "He had a lot of time for the fans," said Mark, who is a civil servant now living in East Anglia. "He would always be the last player to leave the training ground or leave the ground, making sure that everyone who wanted an autograph got an autograph, and he held that through all his life. "In my eyes he was the old-fashioned gentleman sportsman, always well presented, always representing the club and giving the fans what they wanted." 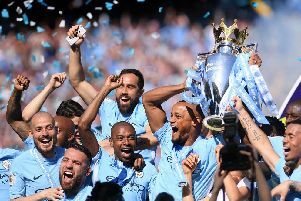 City are now a completely different club from the one Trautmann represented, with the money of Sheikh Mansour having catapulted them to a position of sustained pre-eminence. Under the inspirational guidance of Pep Guardiola, this season they are in contention for an unprecedented quadruple. Mark Trautmann said: "It is quite a poignant time for my dad's film to be coming out, with everything that's going on with Europe, the discrimination players are still experiencing from fans. "But the performances of City, and the potential they have got this year to get so many trophies - he would definitely be pleased with the way they are playing."